GAO-13-496T: Published: Apr 9, 2013. Publicly Released: Apr 9, 2013. 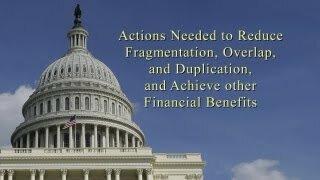 In his April 9, 2013, testimony to the U.S. House of Representatives, Comptroller General Gene Dodaro provides an overview of GAO's 2013 Annual Report on opportunities to reduce fragmentation, overlap, and duplication and achieve other financial benefits for the federal government. The Comptroller General also follows up on progress from GAO's 2012 and 2011 Annual Reports. In summary, GAO's 2013 annual report identifies 31 new areas where agencies may be able to achieve greater efficiency or effectiveness. Within these 31 areas, GAO identifies 81 actions that the executive branch or Congress could take to address the issues GAO identified. Although it may be appropriate for multiple agencies or entities to be involved in the same programmatic or policy area due to the nature or magnitude of the federal effort, GAO's report includes 17 areas of fragmentation, overlap, or duplication where multiple programs and activities may be creating inefficiencies. The report also identifies 14 additional areas where opportunities exist to achieve cost savings or enhance revenue collections. The executive branch and Congress have made some progress in addressing the areas that GAO previously identified. In our 2011 and 2012 annual reports, GAO identified approximately 300 actions among 131 overall areas that the executive branch and Congress could take to reduce or eliminate fragmentation, overlap, or duplication or achieve other potential financial benefits. As of March 6, 2013, the date GAO completed its progress update audit work, 16 of the 131 overall areas were addressed; 87 were partially addressed; and 27 were not addressed. Within these areas, 65 of the approximately 300 individual actions were addressed. However, 149 actions were partially addressed and 85 actions remain not addressed, highlighting the need for sustained attention and leadership. Through our three annual reports, GAO has identified 162 areas in which there are opportunities to reduce fragmentation, overlap, or duplication or to achieve cost savings or enhance revenue. Within these 162 areas, GAO identified approximately 380 actions that the executive branch or Congress could take to address the issues GAO identified. These areas span a wide range of government missions, covering activities within all 15 cabinet-level executive departments and 17 other federal entities. Collectively, if the actions GAO suggests are implemented, the government could potentially save tens of billions of dollars annually. This testimony discusses GAO's 2013 annual report, which presents 31 new opportunities to reduce fragmentation, overlap, and duplication as well as achieve other financial benefits. It also presents the results of GAO's efforts to follow up on progress made by executive branch agencies and Congress in addressing the areas GAO identified in GAO's 2011 and 2012 annual reports. Through these three annual reports, GAO has completed a systematic examination to identify major instances of fragmentation, overlap, or duplication across the federal government. In light of today's challenging fiscal environment, GAO has also identified additional opportunities to achieve greater efficiency and effectiveness by means of cost savings or enhanced revenue collection. This testimony describes the (1) new areas identified in GAO's 2013 annual report where fragmentation, overlap, or duplication exists among federal programs or activities, as well as other opportunities to achieve cost savings or enhanced revenue; (2) status of actions taken by executive branch agencies and Congress in addressing the 131 areas identified in GAO's 2011 and 2012 annual reports; and (3) the summary results of GAO's 3-year systematic examination across the federal government to identify major instances of fragmentation, overlap, or duplication. For more information contact Orice Williams Brown at (202) 512-8678 or williamso@gao.gov, or A. Nicole Clowers at (202) 512-8678 or clowersa@gao.gov.